Early screen tests with Daniel Radcliffe are equal parts adorable and disarming. His unwavering earnestness and wide-eyed enthusiasm is professional child acting 101. The number of lines he has rehearsed, seemingly before being cast, is impressive. 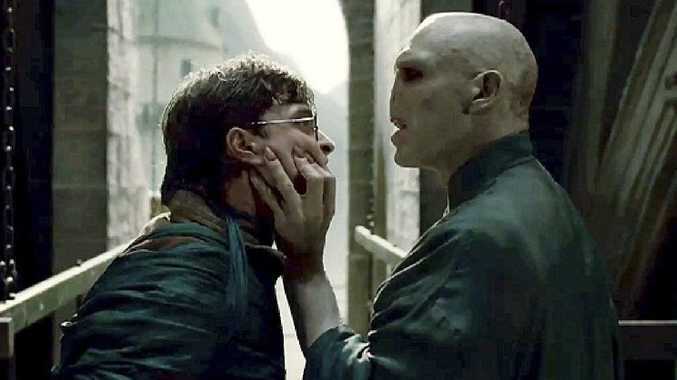 According to casting director Janet Hirshenson, Radcliffe's signing was a nailbiter, with the boy who lived losing interest after initially having his tapes handed over to a casting director in the initial casting period. "He just wasn't interested. He didn't want to be an actor anymore," Hirshenson told the Huffington Post. Hirshenson said Radcliffe was chosen at age 10 because the other contenders were "not going to have the balls" to be the star. "I think in a lot of people's minds, I will always be him. It's rather like the mafia, I guess," Radcliffe said in 2010. "Once you're in, you never get out." 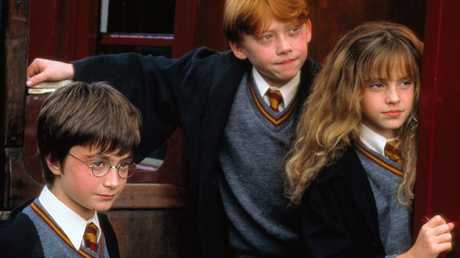 Daniel Radcliffe, aged 11 (centre), alongside his young co-stars Emma Watson, 10, and Rupert Grint, 11, in the year 2000. But despite what appeared to be a gung-ho approach to the audition process and monumental success of the franchise (which has made about $8.99 billion profit), Radcliffe has repeatedly stressed that he found his own acting lacklustre. "The thing that I will always say about myself is I was not the most gifted child actor," he said. "When I look at other young actors, like when I look at the kids on Stranger Things or shows like that, I'm just like, 'Holy! My god! How are you doing that?'" The comparison is not surprising when you look at reputable film reviews from the time, which were often surprisingly harsh when assessing of the child actors' performances. The New York Times review of Harry Potter and the Prisoner of Azkaban savaged a then 14-year-old Radcliffe's performance. "Mr Radcliffe, arriving at puberty, may also have reached the limit of his range as an actor," the review said, adding his ability to show emotion amounted to a "tendency to blink and look nervous". "I never liked watching myself on film but I do make myself sit through it," Radcliffe remarked in 2014. "I'm just not very good … I hate it," he said of his performance in Harry Potter and the Half-Blood Prince, when he was aged 20. "My acting is very one-note and I can see I got complacent and what I was trying to do just didn't come across. My best film is the fifth one (Order of the Phoenix) because I can see a progression." Watson, who played Hermione Granger, mirrored these feelings, saying she found learning to act on set "traumatic". As a nine-year-old, she memorised all her lines (and everybody else's). An unearthed clip shows her mouthing along with her co-stars as they deliver their lines. It's actually 100 per cent adorable, but she said it brings back horrible memories. "I created issues because of this," she explained of her nervous tick. "I would ruin takes." 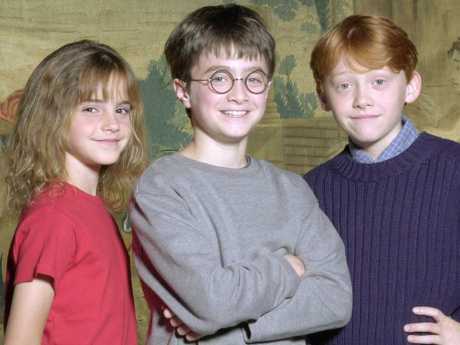 Emma Watson (right) was so keen in the early days she learnt her co-stars’ lines too. Radcliffe also acted out in various child actor ways, saying he turned up to set drunk. He has not disclosed which films or scenes. He said his personality was a "problem", being prone to being "highly addictive" and described a super un-magical life of drinking himself to blackout every single night. The stars of Potter often described a deeply shielded life where they were ferried from their homes to set and home again, while being told what to eat between shoots. When free of the films' clutches, Radcliffe used the snatches of free time to get wild. While he never drank "on set", he was often still drunk during the day. "I can point to many scenes where I'm just gone. Dead behind the eyes," he said in 2012. He got sober in 2010. Radcliffe's aggressive approach to proving himself came between the release of the fifth and sixth Potter movies. He appeared in a revival of the 1973 play Equus, a tale of a psychiatrist's attempts to treat a teenage boy who is obsessed with horses. The play required a then 17-year-old Radcliffe to appear completely naked on stage for lengthy scenes, unencumbered by props. The role was described by Radcliffe as less of an exercise in acting and more of a feat of endurance. "What I did in Equus, which was effectively stand (on stage) completely naked for about ten minutes," he said, was about not going "Oh my god" and the audience not going "Oh my god". Radcliffe also described seeing audience members filming and photographing him during the performance. Clearly high on the freedom the play afforded him, the teen bragged in an interview, "I did three films last year and I got naked in all of them." He had three Potter films left to go. "There were times when I was like 'I'm done'," Grint, who played Ron Weasley, said in October. "Filming Harry Potter was a massive sacrifice. You take for granted anonymity, just doing normal stuff." He described the day-in-day-out process of being photographed in the street as "dehumanising". In 2007 when Watson was 16, a stalker reportedly entered her school and harassed her, leading to the police being called and the actress having to hire a bodyguard. There were "further incidents" and, after the release of the fifth film, rumours abounded that Watson was out, The Sun reported. Her co-star Grint told the News of the World "Emma doesn't want to do it anymore" and that their relationship had become prickly. "I always try and make decisions in my life based on what's right for me," Watson said at the end of the films. "They essentially moved the Harry Potter film schedule around my exam dates, which was amazing," she said. Grint spoke recently about how being a child actor starkly divided his own life. Before being cast in Harry Potter, his life was decidedly working class. He was one of five siblings and his parents both worked in retail. Grint told The Guardian that when he was cast he "left school straight away and things have never been the same". As a younger child actor, he found being in the films fun. But the press tours and red carpet junkets were "an attack on the senses" and he "didn't excel" in the high-pressure environment. "It was really exciting when I was about 11 or 12, but it got harder in my teenage years. Sometimes you just want to be invisible," said Grint, who has also described himself as a natural introvert. Grint also said that as a youth he "feared god", having been educated in a Catholic school, and the supernatural themes of witchcraft and the occult didn't breeze past him. "I was quite anxious and worried about religion and the dogma attached to (the films)," he said. He also spoke about a feeling of impending doom as the film franchise worn on, that the expectation of a scandal grew in direct proportion to his fame. "I don't want to liken it to coming out of prison because it wasn't a prison, but it did feel like stepping out of an institution," he said. 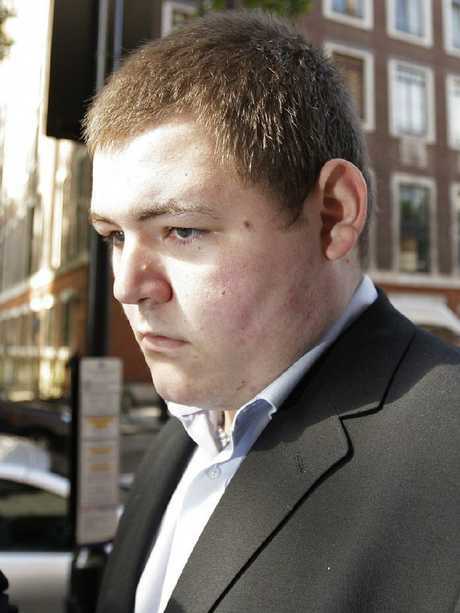 Waylett, who played bruiser Vincent Crabbe, had his home searched after being stopped by police for suspicious driving. They searched his car and found bags of marijuana and later found another 10 plants when in his mother's home. His lawyer argued his case was a sad and complex one, and he had become a "withered actor by the age of 22". 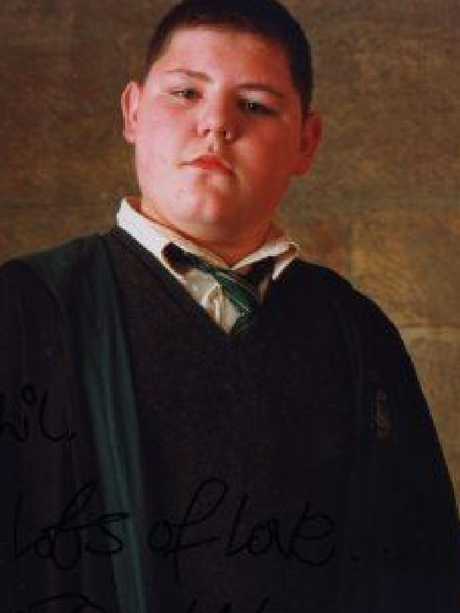 Jamie Waylett played Vincett Crabbe in five Harry Potter films before his arrest in 2009.